POLICE were able to see community spirit in action when staff from the Monto Grand Hotel and IGA joined together to help out their community over the weekend. Having no power from Ex Tropical Cyclone Marcia meant refrigerated and frozen foods at IGA were likely to go to waste, so teamed up with supplies of ice at the Grand Hotel would help the food stay fresh a little longer. 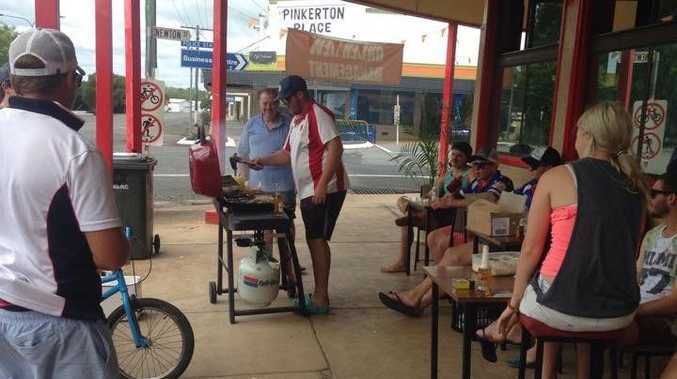 Both businesses were able to provide food and beverages for locals, backpackers and tourists for lunch on Saturday and dinner both Saturday and Sunday. More than10 kilos of sausages were cooked along with a few kilos of bacon, dozens of eggs and a variety of salads. Gold coin donations were requested for the BBQ menu, resulting in $260 raised. Tina from the Grand Hotel expresses her thanks to everyone who helped out, especially Richie from Civil Mining & Construction. Funds raised will be forwarded to emergency rescue organisations who have assisted the Monto community.